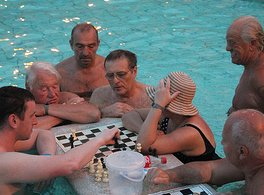 The 2013 Night of Baths Party is a much awaited Budapest festival. Originally, the Night of Baths festival known in Hungarian as the ‘Furdok Ejszakaja’ was planned some time between 2013 Feb-April, but then the Magic Bath Parties in Lukacs Bath (€18) were very popular, and from June 1 until September 28, 2013, the Szechenyi Bath Parties (€22) rock the nightlife of Budapest city. 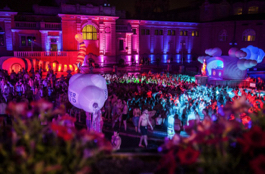 Tip: the most incredible bath party in summer is the Water Circus Party in Budapest in Szechenyi Baths. Book while you can. Anyway, it does not mean that the Night of Baths Festival will be cancelled in 2013. Watch out for the autumn / winter months for updated news. 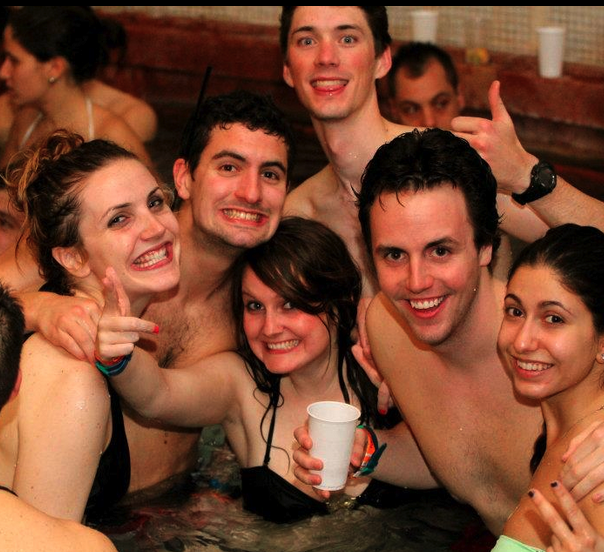 But what is the Night of Baths party festival like in Budapest? Unique, awesome, fun! DJs play the latest trendy remixes, laser shows color the walls, beers, wines, cocktails are readily available, flipflops and towels stand in heaps by the pools, and people are having lots of fun, even if the weather is chilly, as 4-5 thermal baths of Budapest Hot Spring supply is the venue of the festival! 10 pm – 3 am, maybe Winter 2013. The date is unconfirmed yet. 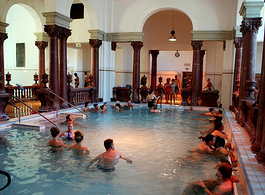 You can buy tickets in advance for the Night of Baths festival, or buy bath tickets queuing outside the baths, where long lines build up by 10 pm. If you have a pre-purchased ticket, you can stand in the speed queue. 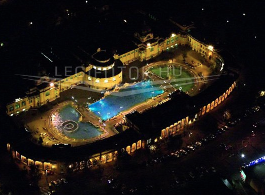 Szechenyi Bath gets pretty busy and crowded on these nights as the entrance fees are very low (all time low). 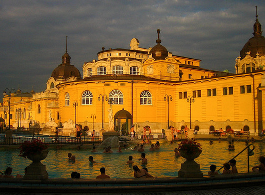 You can travel between the baths by using the Budapest public transport system (night buses), or by taking the official party taxi cars, which offer special, cheap, flat rates from one bath to the other. See more info about Budapest festivals. I am planning a trip in Vienna and I would like to visit Budapest during my stay. I am trying to find out when your Night of Baths is going to be as I would love to be there. Do you have an idea on the date? Hi Lyna, the exact date of the 2013 Night of Baths festival has still not been agreed upon, I am sorry, but we will try to make sure to contact you and follow up on this thread as soon as the festival gets the green light. The organizers of the Night of Baths party festival will very likely to be able to schedule it for the beginning of March (Saturday is the regular day, but it could be a Friday night too). 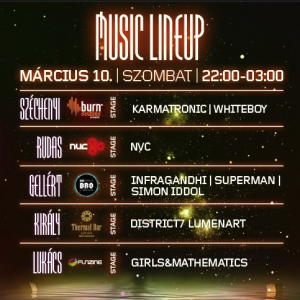 In the meantime, the organizers (the party team) of the Budapest Magic Bath party series at Lukacs Bath have announced that the winter bath party series (called Magic Bath) will continue from 2 March. As Lukacs Furdo is usually part of the Night of Baths festival, and other events and conditions need to be harmonized with the 2013 Furdok Ejszakaja festival, things are a bit complicated now. We will get back to you as soon as the dates have been fixed. Now the dates have not been finalized yet, but it seems very very likely that by mid March on a Saturday night, you will be able to enjoy a bath party one way or another. Maybe only a single party at Lukacs Baths, or maybe a party series at the major Budapest thermal baths. I have to book my flight now so I am just hopping this will happen during my stay. I was wondering if there is a date for the night of baths parties yet? Hello Melissa, we are sorry to say that there is still no definite date for the Night of Baths 2013 Festival. We will update our bath party info as soon as the decision has been made. In the meantime, we encourage all tourists to check out the Magic Bath party series in Budapest Lukacs Bath (another nice and historical bath, opposite the Margaret Island, on Buda side). This party may not be the all in bath festival, but it is still fun, and a sparty.